This is the latest in our series of "Brewer Sportraits", informative biography/cartoons by Lou Grant (the Sentinel's cartoonist, not the television character later named after him). 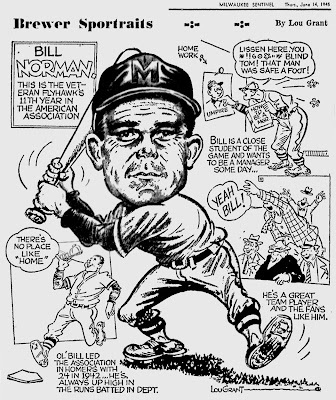 The single panel depicts Brewer outfielder Bill Norman. The veteran "flyhawk" (why shouldn't the outfield position have a catchy nickname?) 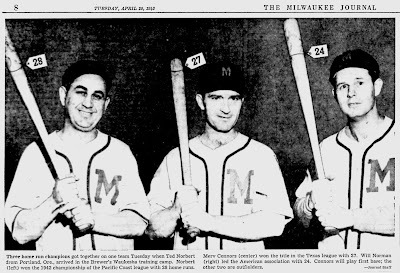 came to Milwaukee in 1942 from the International League. He had spent parts of 1931 and 1932 at Comiskey Park with the White Sox, but other than that sojourn into the Bigs he was a minor league lifer. A hard-traveling one at that; when he signed his Brewer contract, Norman had already taken the field for fifteen different minor-league clubs in thirteen seasons. The journeyman found an instant home in Milwaukee. He hit 24 home runs that season, more than anyone else in the American Association, and was part of a lineup that led the league in virtually every offensive category: runs, hits, doubles, RBI, batting average, total bases and slugging percentage (they missed the team home run title by six and triples by only three). That was good, but the second-place finish wasn't good enough for team President Bill Veeck. Sport Shirt Bill spent the 1942 offseason wheeling and dealing; he sold some of the best players to major league clubs, and sent the others wherever he could. Of that 1942 squad, he kept only four men. His new hard-hitting outfielder was one of them. Veeck surrounded Norbert's spot in the lineup with other strong bats, bringing in Ted Norbert and Merv Connors, who had just won the home run crowns in the Pacific Coast League and Texas League, respectively. Norman was also known something of a good luck charm for his roomates. Three of them were sold to major league clubs; Eddie Stankey, to the New York Giants, Tony York, soon to be a Chicago Cub, and Hal Peck, known also as Bill Veeck's good luck charm, who was soon calling Brooklyn's Ebbets Field home. After the Brewers signed Nick Cullop as manager in late 1944, Norman was promoted to player/coach. He already had, as the cartoon indicates, designs on being a manager himself someday, preferably within the Brewers' farm system. It was not to be. 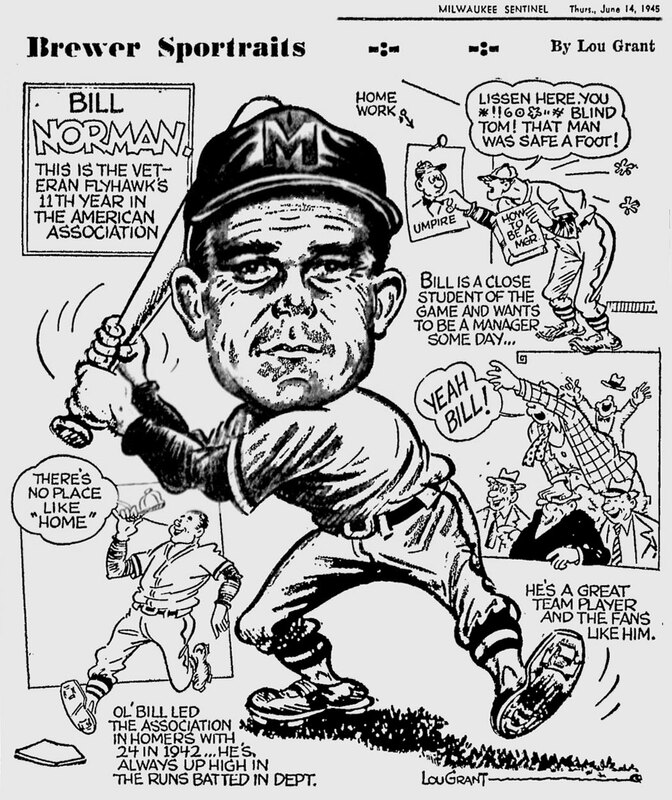 On July 4, just a few weeks after this Sportrait was published, Norman was sold to the Toronto Maple Leafs (the original baseball team, not the famous hockey club named after it). "I just won't be the same away from the Brewers. I had a good following out there in the center field bleachers. It too a few years to win them over. I followed the most popular Brewer of my time—Ted Gullic—and his cronies in the bleachers made it hot for me but I finally got them on my side." After a brief contract holdout, Norman reported to Toronto. At the end of the season, the Maple Leafs offered him the same player/coach role as he had in Milwaukee, and Norman came to see an opportunity within that organization as enticing as he had with the Brews. The Maple Leafs' owners had a notoriously short leash when it came to managers and in December, following only half a season with the club, Norman told friends at a minor-league convention "I'll be managing Toronto before next July 4." He was off by four weeks. On June 5, Leafs player/manager Harry Davis was fired, and Ole Will Norman had his first shot as a skipper. Toronto, a notorious graveyard for managers, let him go at the end of the season after the team crawled to an overall 71-82 record. Once Norman had traded the field for the dugout, however, he never looked back. He went to the Wilkes-Barre Barons, the Cleveland Indians' club in the Eastern League, where he managed for five years and won consecutive pennants in 1950-51. That was good enough to earn him a job as a coach with the St. Louis Browns, where he spent the next two years. In 1954, the Browns moved to Baltimore, and Norman moved to the Detroit Tigers organization. He coached in their system, including a stint managing their top club in Charleston. Bill Norman's managerial star continued to rise in Charleston, and his next job was in the major leagues. 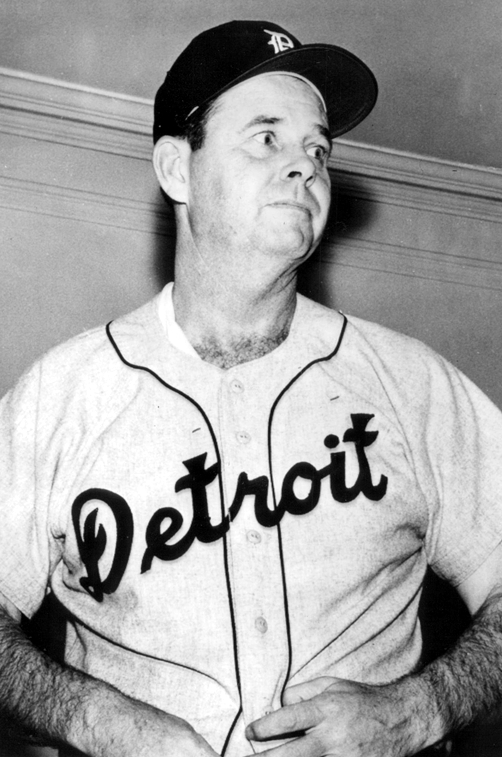 The Tigers stumbled to a 21-28 start in 1958, and when the Detroit brass wanted a change, they looked no further than their AAA farm club. Norman came to Detroit and led them to an eventual .500 finish, 77-77. That was good enough to bring him back in '59, but it was short lived; a 2-17 start led to his own early ouster. Bill Norman then turned to his old Chicago White Sox, joining the club as a scout. He filled in as a pilot for their PCL club in San Diego during the last part of 1961 before returning to scouting. On April 21, 1962, he was visiting Milwaukee in that capacity, in town to scout the Braves. He started having difficulty breathing and checked himself in to St. Luke's Hospital. Shortly after being diagnosed with "a heart difficulty", Norman suffered a cardiac arrest and died. He passed away at the age of 51, in the city that so loved to watch him play the outfield twenty years before.